First known as Ms. Marvel in the 1970s, Binary in the 1980s, and recently taking on the name Captain Marvel in 2012, Carol Danvers is a human who developed alien Kree characteristics after an accident involving the original Captain Marvel. Later gaining powers that allowed her to tap into stellar energies, Captain Marvel is one of the most powerful superheroines, appearing on television and in video games as well as the comics. 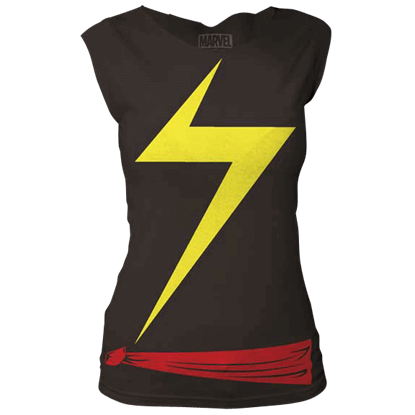 For fans of Captain Marvel, Superheroes Direct offers a variety of apparel, including t-shirts in womens styles displaying iconic Captain Marvel graphics, as well as other Captain Marvel collectibles. Keep checking back here at Superheroes Direct for updates to our ever-growing selection of Captain Marvel merchandise. Start your morning right with the help of a superhero classified as a Power Level 8. 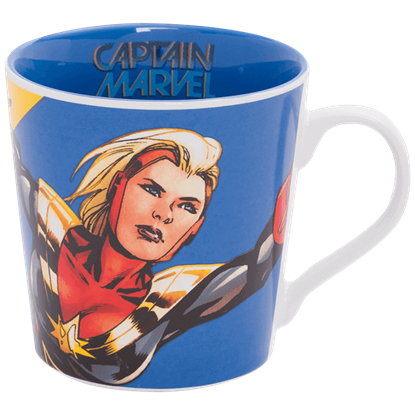 Possessing such abilities as flight, superhuman strength, and photonic blasts, Carol Danvers also appears on the Captain Marvel Ceramic Mug. An unearthly energy radiates from our hero as she confronts the enemy. A youthful warrior steps up to answer a heroic calling. Be thrilled by the exciting montage of female superheroes in the Marvelous Spider Team-up Button Set. Several different women have worn the suit of Ms. Marvel throughout the years, the most well-known being Carol Danvers. Join the ranks of this powerful and iconic female superhero by wearing this Ms. Marvel Suit Sleeveless Top!